1812: born in Edo. His father gives him the name of Ichimura Toyomatsu. 1818: he makes his first stage appearance and receives the name of Ichimura Kamenosuke. 3rd lunar month of 1820: premiere at the Tamagawaza of Tsuruya Nanboku IV's drama "Sakura Butai Maku no Datezome"; Kamenosuke plays the roles of Tsuruchiyo [casting]. 7th lunar month of 1820: his father Ichimura Uzaemon XI dies. 10th lunar month of 1821: the Ichimuraza is back in business. 11th lunar month of 1821: Ichimura Kamenosuke takes the name of Ichimura Uzaemon XII and becomes the new official zamoto of the reopening Ichimuraza. The business is in reality managed from behind the scenes by Fukuchi Mohê because the new Uzaemon is too young. Fukuchi Mohê produces the special kaomise program "Nani o Tanete Ukiki no Kaobure", starring Ichikawa Danjûrô VII, Ichikawa Omezô I, Bandô Hikosaburô IV and Ichikawa Monnosuke III. The actors Sawamura Shirogorô II and Ichikawa Raizô IV celebrate their shûmei during this performance. 8th day of the 12th lunar month of 1825: a fire breaks out in the puppet theater Yûkiza, located in the district of Fukiya-chô, and destroys the Ichimuraza. 11th lunar month of 1826: Uzaemon plays at the Ichimuraza 2 roles in the kaomise program "Ise Heiji Shô no Kaomise". 3rd day of the 1st lunar month of 1827: a fire breaks out from the third floor of the Ichimuraza and destroys the Ichimuraza, the Nakamuraza and 2 puppet theaters. 9th lunar month of 1827: Uzaemon plays at the Ichimuraza the role of Shûrinosuke in the drama "Domo Mata". His stage partners are Ichikawa Danjûrô VII (Matahei), Iwai Kumesaburô II (Otoku), Bandô Hikosaburô IV (Utanosuke) and Kataoka Nizaemon VII (Shôgen). 21st day of the 3rd lunar month of 1829: a fire breaks out from the shop of Owariya Tokuemon, district of Kanda Sakuma-chô, and destroys the Edo theaters district. The Moritaza, the Ichimuraza and the Nakamuraza are burnt to ashes. 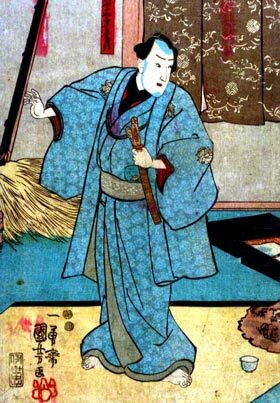 11th lunar month of 1830: Uzaemon plays at the Ichimuraza 4 roles in the drama "Genpei Kabuki Nendaiki". 23rd day of the 12th lunar month of 1830: a fire breaks out in the district of Nihonbashi Kodenma-chô and destroys the Ichimuraza. 2nd lunar month of 1832: Uzaemon plays at the Ichimuraza the roles of En'ya Hangan, Hayano Kanpei, Sadakurô, Yoichibê, Shioda Matanojô, Kakogawa Honzô and Ôboshi Yuranosuke in the classic "Kanadehon Chûshingura". He also plays at the end of the program the leading role of the shirabyôshi Sakuragi in the dance "Yui Narai Kanoko Musume Dôjôji". Uzaemon meets with great public and critical acclaim. 7th day of the 2nd lunar month of 1834: a fire breaks out in the district of Kanda Sakuma-chô and destroys the Ichimuraza and the Nakamuraza. 8th lunar month of 1834: Uzaemon plays at the Ichimuraza the role of Matsuômaru in the classic "Sugawara Denju Tenarai Kagami". His stage partners are Matsumoto Kôshirô V (Shihei), Ichikawa Yaozô V (Sakuramaru) and Ichikawa Komazô V (Umeômaru). 11th lunar month of 1835: Uzaemon plays at the Ichimuraza in the drama "Kigoto no Hana Hitome Senbon". 7th lunar month of 1836: premiere at the Ichimuraza of the drama "Shinobi Yoru Koi no Kusemono". The roles of Princess Takiyasha and Mitsukuni are played by Ichikawa Kuzô II and Uzaemon. 11th lunar month of 1838: premiere at the Ichimuraza of Nakamura Jûsuke IV's Tokiwazu-based dance "Hanabutai Kasumi no Saruhiki", commonly called "Utsubo Zaru"; Uzaemon plays the role of Tarôkaja [casting]. 6th day of the 10th lunar month of 1841: a fire breaks out from the backstages of the Nakamuraza in the district of Sakai-chô. It spreads and destroys the Ichimuraza and the Nakamuraza. 20th day of the 10th lunar month of 1841: the Edo authorities forbid the reconstruction of the destroyed theaters in Sakai-chô. 19th day of the 12th lunar month of 1841: the Nakamuraza, Ichimuraza and Kawarasakiza are ordered to move to the remote district of Asakusa Saruwaka-chô. 9th lunar month of 1842: the Ichimuraza reopens; Uzaemon produces the program "Chobanzai Araki no Shimadai", starring Seki Sanjûrô III, Ichikawa Kuzô II, Nakamura Utaemon IV, Nakamura Fukusuke I, Bandô Shûka I and Onoe Kikujirô II. 1st lunar month of 1843: premiere at the Ichimuraza of the dance "Kashiragaki Ise Monogatari" (commonly called "Noriaibune"), which is staged within the new year drama "Kioi Uta Soga no Hanadashi"; Uzaemon is one of the seven dancers [more details]. 11th lunar month of 1845: Uzaemon plays at the Ichimuraza 2 roles in the drama "Kaikei Shinoda Mitsuki no Funauta". 1st lunar month of 1846: premiere at the Nakamuraza of Sakurada Jisuke III's Tokiwazu-based dance-drama "Kagura Uta Kumoi no Kyokumari", which is commonly called "Dontsuku"; Uzaemon dances in it [more details]. 2nd lunar month of 1847: premiere at the Ichimuraza of the 11-role hengemono "Kanadehon Chûshingura" (same title as the classic drama "Kanadehon Chûshingura"); each role, which is performed by Uzaemon, is based on 1 act of "Chûshingura" [more details]. The 6th role, "Kagoya", is an independent dance belonging to the current Kabuki repertoire. 11th lunar month of 1849: Uzaemon plays at the Ichimuraza the role of Yogorô in the drama "Modori Kago". 1st lunar month of 1851: Ichimura Uzaemon XII and his son Ichimura Kurôemon respectively take the names of Ichimura Takenojô V and Ichimura Uzaemon XIII at the Ichimuraza. His son becomes the new official zamoto of the Ichimuraza. Summer 1851: Takenojô appears on stage for the last time, playing the role of the warrior Kumagai Jirô Naozane and Jûtarô in the dramas "Ichi-no-Tani Futaba Gunki" and "Taiheiki Chûshin Kôshaku", which are staged at the Ichimuraza. He suddenly falls ill and expresses the wish to go on pilgrimage on at the famous Kotopira shrine on Shikoku island but dies before going there, the 20 of 8th lunar month of 1851. Ichimura Takenojô V was both a talented tachiyaku actor and the dynamic zamoto of the Ichimuraza. The excesses of his lifestyle were famous. He went for example on pilgrimage at the temple dedicated to the deity Fudô Myôô in Narita in 1847, bringing with him a band of forty guests (actors, musicians, courtesans, taiko mochi and ... hairdressers). They feasted for 10 days and he generously spent around 1,200 ryô, more than one year of salary for a top-ranking actor!.